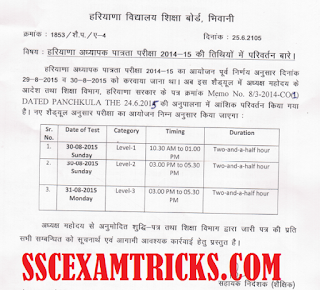 HTET Exam Time Table / Exam Date Declared - Download HTET 2015 PGT TGT PRT Exam Schedule / New Exam Date: HTET is going to be held on new dates i.e. 14th & 15th November 2015 at various centres across Haryana. The latest news is that HBSE has published time table for new exam of HTET PGT, TGT, PRT 2015. The Admit card will be available 10-12 days before the new date of exam. These are expected to be available very soon. Those candidates who are going to appear in the exam, they can note down their schedule for exam or time table for revised exam. HTET 2015 Exam Date Revised - Check New date of HTET 2015- Download HTET 2015 Change of Date Notice- HTET 2015 Reschedule Date - Latest News of New Date of HTET Examination 2015: The latest news to all of us that, Haryana School Education Board (HBSE), Bhiwani had revised HTET Exam date through official notification 1853/A-4 memo no. 8/3/2014-CO(1)Dated Panchkula 24.06.2015 released by the board. HBSE has provided new date of HTET Exam Schedule. In the new schedule/ reschedule of HTET 2015, the HTET examination was scheduled to be held on 29th August 2015 and has revised to new date on 31st August 2015 for Level-III. There is no change in HTET 2015 which will be held on 30th August 2015 for Level I & Level II. 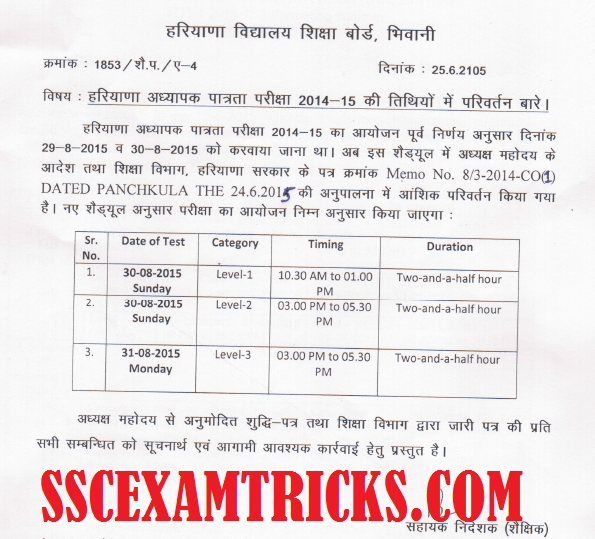 HTET Examination 2015 has revised due to the Indian festival on the same date. Raksha Bandhan is the most precious festival which will be held on 29th August 2015. On this date, HTET Level III Exam was scheduled. The new notification has released on 25th June 2015 in which exam date of Level III Examination of HTET has been revised to new date 31st August 2015. The rest of the schedule of HTET Exam 2015 will remain same. You must note down the revised schedule of HTET Eligibility written test for year 2015-16. HTET 2015 will be held for two and half hour for Level I, Level II & Level III. HTET 2015 will be conducted to check eligibility of the candidates for Haryana JBT/ PRT, TGT and PGT posts. You need to remember that Haryana Government has revised the final selection process for the post of JBT/ PRT, TGT and PGT posts. Haryana Staff Selection Board (HSSC) TGT & HSSC PGT posts have been released through latest official notification on official website. You must be HTET qualified which is mandatory condition to apply online for JBT/ PRT, TGT & PGT posts. It is important for you to remind HTET Revised schedule to attend examination on the exact date and time. You can download HTET Admit Card 2015 which will be available on 18th August 2015 on official website.